August 11, 2013 Victoria, BC (ISN) – The long ball continued to haunt the Victoria HarbourCats at Royal Athletic Park, as the Bellingham Bells secured a series win with a 4-1 victory. 2513 loyal ‘Cats fans, the 2nd largest crowd of the season, were on hand Saturday night whether they were there to see the game, the post game fireworks or ‘Boomers Revenge’ is anyone guess. The game itself was entertaining as the HarbourCats opened up an early lead when a Bells throwing error on a Timmy Richards single allowed Austin Russell to score from 1st base to put Victoria up 1-0 after 2 innings of play. Unfortunately that was all the scoring Victoria could muster stranding runners at 3rd base 3 times throughout the game. Bellingham would take the lead in the 4th inning when Ryan Kirby launched a 2 run homerun off HarbourCats starter Tyler Rowe. The Bells would add another in the 7th when Christopher Beall’s shot cleared the fence. Bellingham would add another in the 8th putting them up 4-1. Next up for Victoria fans was ‘Boomers Revenge’ as many remember, and those the didn’t got a reminder on the video scoreboard, play by play announcer Matt ‘Boomer’ Zupanc had a day of infamy at a Victoria Seals game when he competed in the Dizzy Bat Race and performed a nasty face plant into the dirt. Matt determined to redeem himself before the HarbourCats faithful, took to the field in a boxers robe ala Rocky and after 20 or 30 spins took off down the field while he did have a couple of falls he managed to finish the race and walked off the field with his head held high as well as raising $1689 for the Vaculitis Foundation of Canada. Next on the agenda was the Fireworks display. 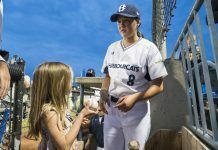 After touting it was going to be the largest private display in Victoria history, the HarbourCats delivered. The show went on for close to 15 minutes, and well not quite the Symphony of Fire in Vancouver, with the fact that it took place in a residential neighbourhood with limited space it was impressive. The fans that stayed, and a few that straggled in at the end of the game, were cheering throughout the performance. The HarbourCats and Bells close out their 2013 WCL seasons today at 1:05 at Royal Athletic Park.